Last summer’s painting season I found myself doing a fair number of panoramic diptychs. I’ve been using two 1/4 sheets of watercolor paper (11×15″) taped to 14×18″ coroplast boards to give me a wider landscape format. I expect I’ll be doing more of these this year. I quite enjoy the panoramic feeling – and it’s super convenient to do it in two panels. Much like a big sketchbook, being able to ‘fold them up’ allows me to easily carry a big painting like this to pretty much any location. Oddly, one piece of gear that becomes a huge part of this trick, is my new(ish) shoulder bag. It seems like a minor detail, but it makes all the difference to have just the right bag. I like to be able to setup and take down quickly. Sometimes you simply won’t get the shot if you don’t throw down your gear and get started. But I also like to keep most of my gear still in the bag at my feet – in case I have to relocate quickly. Like that time we were painting on a not-actually-out-of-service train track. This expandable beauty fits my 14×18″ drawing boards like it was custom tailored for them. I can carry a fat stack of six panels, and still fit my Sirui Tripod , palette, water bottles, and brush case. The magnetic assisted tie-down straps are speedy and secure – allowing me to reliably stuff it just a bit beyond its official capacity. It has two well-positioned luggage handles on the short side, so on the subway or in a crowded restaurant, you can carry it briefcase style, and not bark anyone’s knees. The shoulder strap is comfortable, and easily tightened to snug the bag to your body – and can even be re-positioned to change the angle on your back in case you’re a bit taller/shorter than average. I particularly like the easily accessed side zip pockets (one on each side). These are designed to be reached without fully removing the bag from your shoulder. Great for your small sketchbook and pens, so you can instantly have a book out and drawing for those action shots. Or for your keys, so you can stumble through your door without having to dump your paintings on the doorstep. So, there it is – a simple bit of kit, that makes it a little easier to do larger paintings out on location. ← Biodome Redux : Big Ink! It’s always great to hear of new bags. My cousin and I are both purse collectors. She explained our obsession to me when she said: “It’s not the perfect purse or bag, but it’s the perfect one for today.” It hold true for this lovely bag: it’s just perfect for what you need it to do! Great info thanks. Will you be working this way in the Tuscany Workshop in June? Is the trip a “go” yet? Yes, I’ll be bringing the easel and boards – its the best way to show you guys demos on location. Easier to see than if i was drawing in my lap. Re: if it’s a go – I’m out if town painting Key West right now, but I’ll check in with Patrick at Toscana when we get back next week. I do like Timbuk2 because they are waterproof and I live in the rainy Pacific NW! That bag looks HUGE on you. I now see there are two sizes. I need to lighten my load. Interesting that it’s far cheaper on Amazon than on the Timbuk2 site. Thanks for sharing, Marc. I have found your other kit tips very helpful. I have been on the hunt for the “perfect bag” for sometime, but as I have neck-shoulder issues, the sling style doesn’t work for me :( I am trying to find a backpack that would hold everything, be waterproof, not weight an absolute tonne… & (ideally) not break the bank! 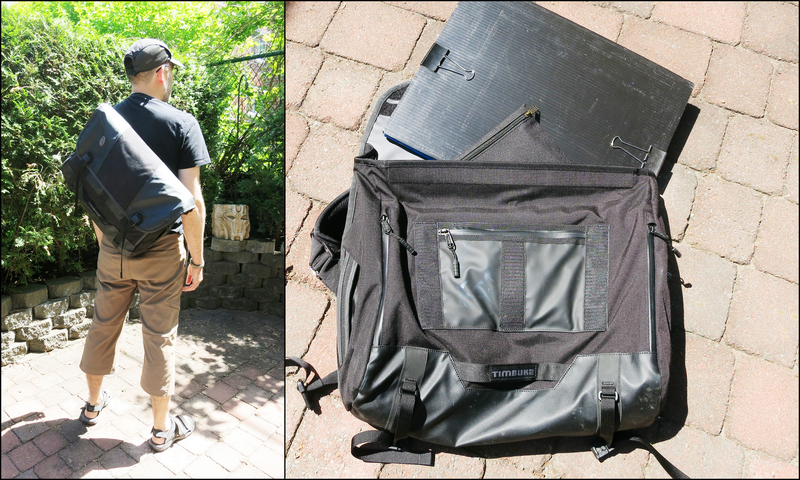 Ya, tricky to find a backpack with this inside square volume – I guess you’d get stuck in doors :) I do have a snowboarders bag that takes a fullsize tripod (its long and thin for strapping on the board). I’ll get around to snapping a shot of that one when we get home. But it wouldnt take 1/4 sheets – too narrow. That looks like the dam in Manotick, Ontario. Is it? 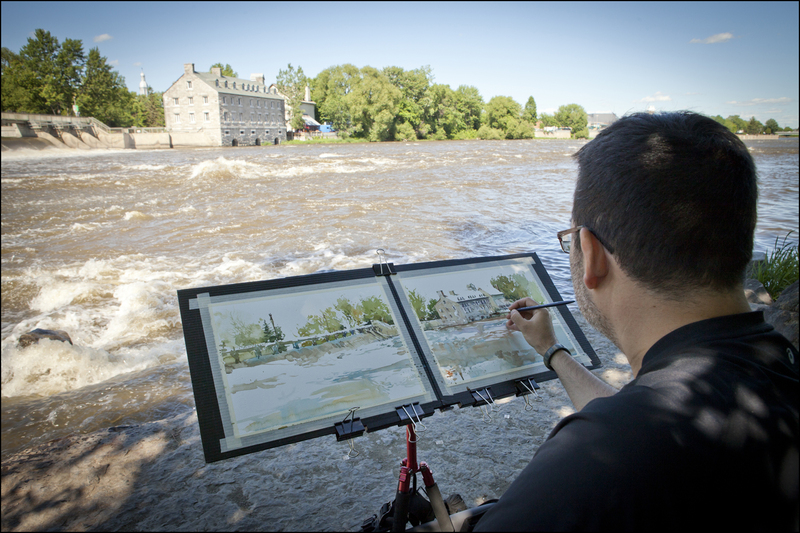 That’s painted at Terrebone QC, a bit north of Montreal – just looking now at Watson’s Mill in Manotick – (yay google images!) it looks to be almost the same. Just that the main building is rotated 90 degrees. Interesting. I guess they might have been build near the same time? Hi! I’m actually sewing a messenger bag+sketching bag. I’ve did this one for markers goo.gl/TNlJ2E, but I was thinking that the next one could be for markers+water color. Re: bag for watercolor – this first idea going to be very tricky: One thing that happens is that the paint in your paint box can run – if the paint is fresh, is can slide around from spot to spot. I mainly had this problem with Cobalt Teal and sometimes Sap Green. (What I do now is try to leave the paint box open over night to set up a bit). But – if it was at all possible to design the bag so that it hangs HORIZONTALLY from you back! Keeping the bottom of the bag with your paint box somewhat level. I know that is a major engineering problem – but that’s one thing that would be great. Other ideas: those mesh elastic pockets for water bottles – that would be great to have on the inside walls, so your water bottle could stay snug. I always dislike them on the outside of backpacks. I’m sort of picky – it looks messy to me to see the bottle hanging from the front. Plus if you have a brush holder section – if you can embed a plastic sheet in the walls of the bag, so that the bag would never crush down on the brushes? (Does that make sense?) Like a semi-rigid panel in the back. I put a sheet of coroplast in the back of my bag to keep the shape ‘square’. 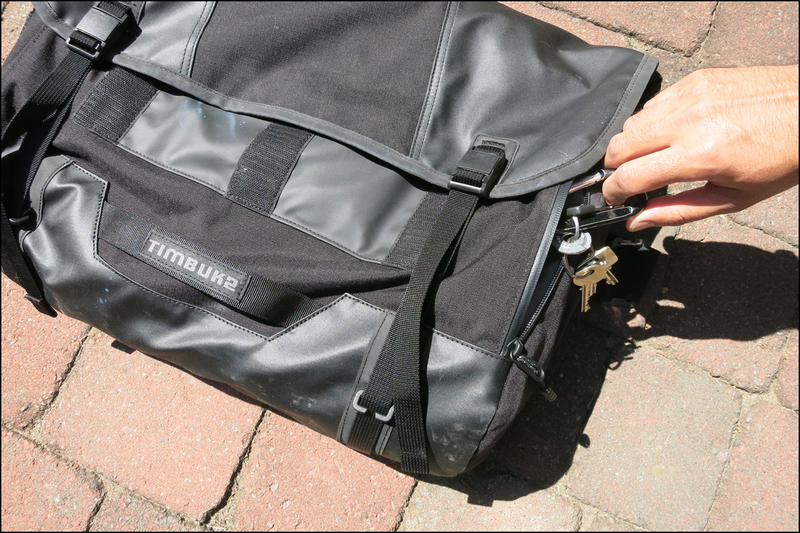 The last thing that I love about the Timbuk2 bag – is the zippers pockets on the outside (where the pink panel is on yours) that can be opened even when the flap is closed. That allows you to reach in sideways and get your keys/phone without opening the main area. If I was going to be a crazy person, I’d also make a few zipper pouches in matching fabric to hold tubes and stuff like a pencil, paper towels, and my mist-bottle. I like to have pouches inside the main body of my bag so things don’t mess about. OCD I know! Wow. Those are actually amazing ideas. I can definitely work with that! :) Hmmm. Do you want to do a sketch of a “perfect” bag? I can try and make one for you – like a prototype. The only problem is the color, I work with a fabric that is water proof and I don’t think they have it in black. :/ Maybe grey (like the grey on the front panel of the bag I made)? The tricky part is that you would have to send me size of the pockets you would like (as I have no idea what stuff you use). wow, that is a very generous offer – too much! I wouldn’t expect you to make me one:) let me get back to you on FB we’ll talk about it? Which size did you end up buying? All I know is it fits a stack of 5 or six 14×18″ drawing boards like it was made for it. I *think* that’s what they call the ‘large’? I’m curious as to how you attach your drawing boards to the tripod, can you advise?